A consequence of Climate Change may be higher frequencies and intensities of extreme climate events all over the world. 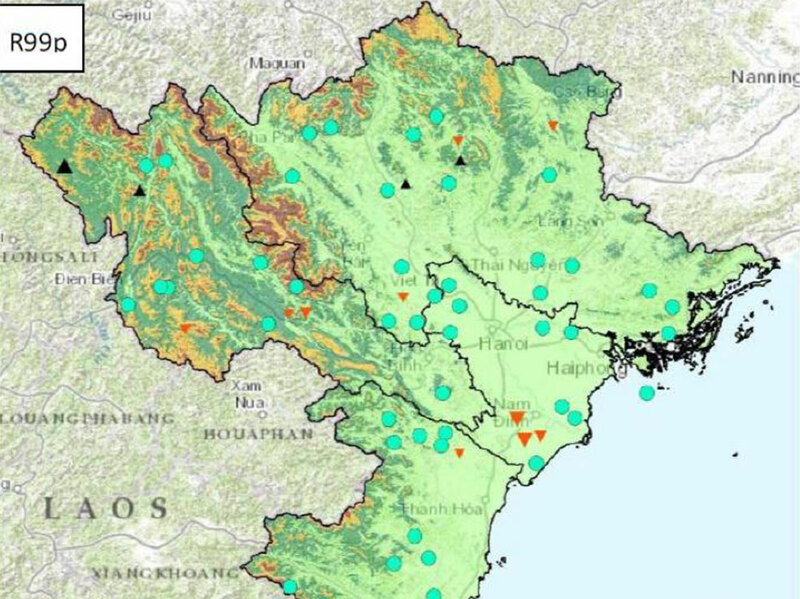 This paper takes a closer look on the Northern Vietnam climate conditions. The area of interest are the geographical regions North East, North West, Red River Delta and North Central Coast. For research extreme climate, the data from 72 meteorological stations for the time period 1975 to 2006 were used and tested for the rain season with the highly recommended method of indices for climate change research after ETCCDI. It is said, that there is a linkage between the indices and topics of social and economical impacts, but this is not a clear fact. The climate change and extreme precipitation indices R95p, R99p, SDII, PRCPTOT and a modified R50mm are used in this study. The question, if there are statistic significant trends is answered by the Mann-Kendall Trend test. The results show, that the indices are strongly influenced by the variations of the Vietnamese climate. Many stations have no significant trends. For the investigated time period, most of significance trends were decreasing. But there is a positive correlation between the total rain sum at rain season PRCPTOT and the extreme climate indices R95p and R99p, so more extreme climate intensities can be expect in a changing climate, because climate models show, that higher precipitations totals are probably for the area of interest.